Vanuatu Daily Post – A local social responsible business owned by ACTIV Association has beaten hundreds of participants to scoop two gold medals in an international chocolate competition. Aelan Chocolate Makers entered the International Chocolate Salon competition for Artisan Chocolate Awards 2018 in America. From hundreds of participants to this international chocolate event, which is one of the premier international bodies celebrating and honoring artisan and premium chocolates and confections, Aelan Chocolate Makers received awards and great feedback from the panel of judges. The judges include national and regional magazines, newspapers and blog editors, Topic Experts, Local Chefs and Food & Lifestyle Gurus and many from the academy of media tastemakers who attested that “all the Aelan Chocolate bars were lovely”. Four different Aelan Chocolate bars selection were sent to the competition with the Aelan 70% dark chocolate from the Malekula, Malo and Epi origins for the Best Vegan Chocolate Awards 2018 and the Aelan dark chocolate chili pepper for the Top Spicy Chocolate Awards. These awards complete the awards received in 2017 for the cocoa producers from Malekula and Malo for the best 50 cocoa producers in the world at the Cocoa of Excellence competition in Paris, France and the silver medals and Bronze medal received at the NZ International Chocolate Awards in Auckland New Zealand for the Aelan Chocolate bars of Malekula, Malo, Santo and Epi islands origin. The Aelan / ACTIV team has worked hard for the last decade to reach this level of excellence in artisan fine chocolate making with the cocoa producers from different islands of the archipelago improving their cocoa beans with the support of ACTIV Association and its scientist partners of Australian Centre for the International Agriculture Research (ACIAR) and Aelan Chocolate Makers experimenting the best chocolate making revealing the best aromas and flavors from the cocoa beans. 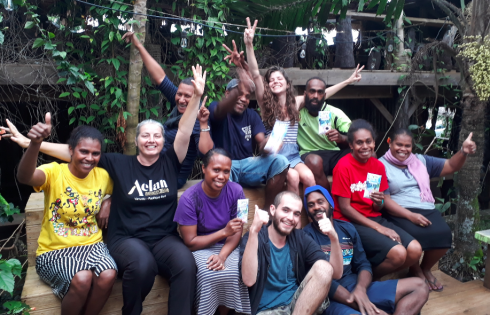 Aelan Chocolate Makers and ACTIV employ 12 Ni-Vanuatu people. The benefits of the chocolate making are re-invested to assist more producers and access niche market for Excellence products to increase the income of the communities and improve their livelihoods. The Aelan / ACTIV team is proud of this achievement in cooperation with all the cocoa producers from the islands, their scientist partners from ACIAR and DFAT funding for the strengthening the trade facilitation structure for the communities products. The team collectively work for reaching excellence from grassroots. You can visit the Aelan chocolate factory daily at the ACTIV centre at the second lagoon where tours are proposed, or visit the Aelan shop on Lini Highway and discover the full range of the awarded Aelan chocolate with the 70% dark chocolate island origin range and chocolate with local products (coconut, nangai, chili pepper, cocoa nibs, crystallized ginger, crystallized turmeric, sea salt, coffee and kava).